ManageEngine Analytics Plus offers a wide range of publishing options to enable easy distribution and collaboration. You can publish the reports and dashboards that you create in ManageEngine Analytics Plus as live embedded reports in your websites/webpages. 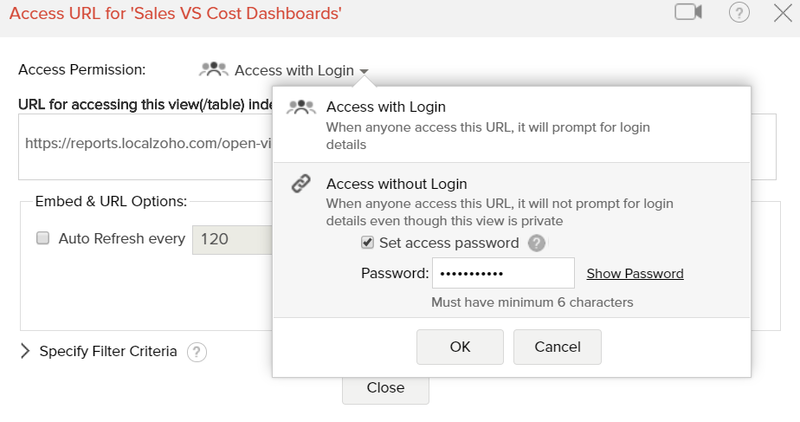 While using the publishing options you could still control the access privileges and permissions provided to the users who access the reports or dashboards published. 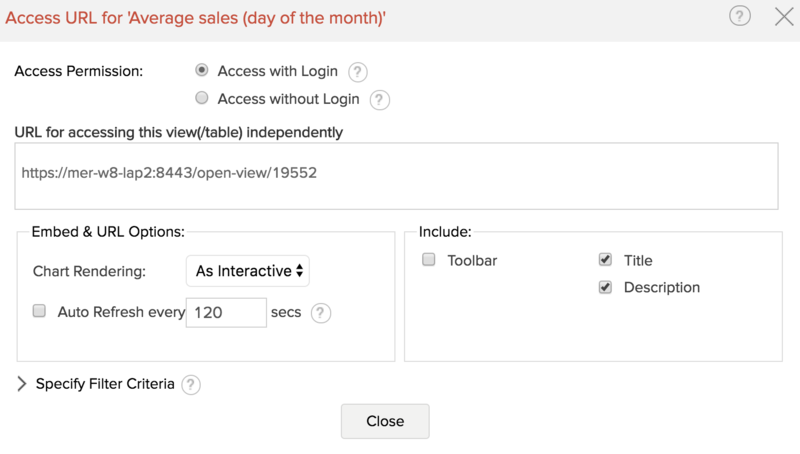 Publish views: You can publish any data, reports or dashboards that you create in ManageEngine Analytics Plus. Embed Reports & Dashboards Anywhere: Embed your live reports and dashboards across Websites, Blogs and Applications for wider consumption. Easy to Access Bookmarkable URLs: You can generate easy to access standalone URLs (Permalinks), which can even be bookmarked, for accessing the reports and dashboards by your users. 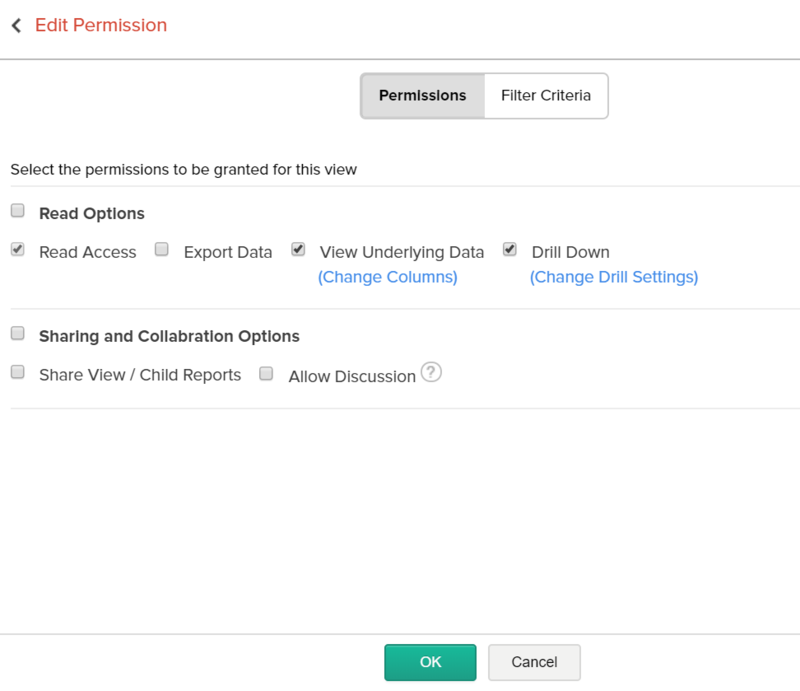 Fine-grained permission control: You can set fine-grained permissions while publishing the reports to users, such that they would be allowed to do only the permitted operations, like read, write, export etc., when they access the reports published. Highly Secure: Apart from permission controls for views, you can choose to password protect or enable access using login while publishing your views. You can easily embed any view (reports, tables & dashboards) you create into a website, web application, blog, or an intranet page using the HTML code snippet (containing an iframe HTML element) auto generated by Analytics Plus. Open the chart that you want to embed and select Publish > Embed in Website / Blog option in the toolbar. The Embed Snippet dialog box will open. Access Permission is set to Access with Login by default. In this mode, only users with a login to Analytics Plus will be able to access the reports. 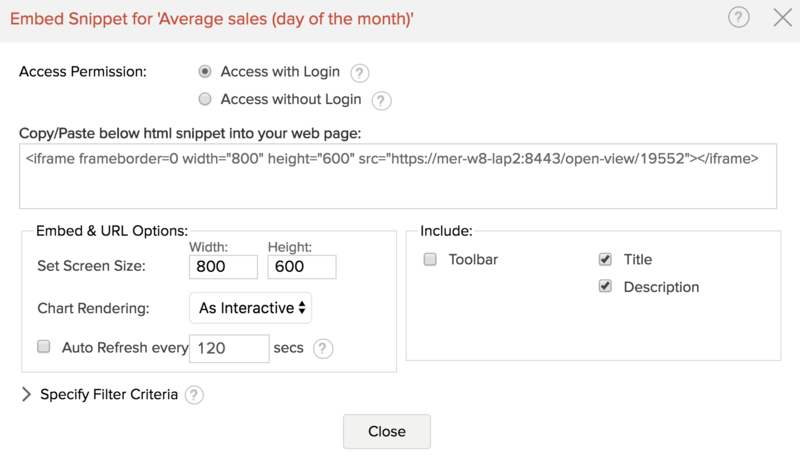 If you choose the Access without Login option, Analytics Plus will generate a private link (URL) for users to view the report without logging into Analytics Plus. This option will be available only if you have opted for the Concurrent Viewer license category. You can also choose to password protect the access to the URL using the Set Password option. The Embed and URL Options section provides options to customize the embedded report such as set the screen size and adjust auto refresh timer. You can choose to display the Toolbar, Title and Description in the embedded report by selecting the appropriate check boxes. Note: Analytics Plus also provides a special option for charts called Chart Rendering that lets you publish a chart as an image (where the chart will be generated as a static image and will load faster) or in the interactive mode where users visiting the web page can view and interact with the report. You can choose to display a selective set of data in your embedded view using the Specify Filter Criteria option. For instance, an embedded sales report can have a 'Region' based criteria such that when a person from Region South views the page, he/she will only see sales from that region in the embedded report. Copy the HTML <iframe> code displayed in the text area and paste it in to the corresponding HTML source code of your web page/blog into which you are embedded this view. The snippet should be included within <body> </body> tags in the web page. Once the <iframe> code is pasted into HTML source code of your web page/blog, users visiting the web page can view the report after successfully logging into their Analytics Plus account. You can create a standalone Permanent URL(Permalink) for any view (reports, charts, pivots, or dashboards) you have created using ManageEngine Analytics Plus. These URL's can be made accessible with a secured login or a private permalink. Users visiting these links will be able to see the latest live version of the view. Permalink enables easy and quick access of reports/dashboards through bookmarking. To create a Permalink, open the chart you want to share, and select Publish > URL/ Permalinkfor this View option in the toolbar. The Access URL dialog will open. The Embed and URL Options section provides options to customize the embedded report such as set the screen size and adjust auto-refresh timer. You can choose to display the Toolbar, Title and Description in the embedded report by selecting the appropriate checkboxes. Copy the URL displayed in the text area and click Close. You can now share this link with your users, who will be able to view the report upon successful login. If you want to edit previously granted permissions provided for the shared view or completely remove access to the private user, do the following. Click on the Edit Permission link . If you want to remove access to the private or shared users, click on the corresponding Remove link and then click Close. You can grant or remove permissions for the selected view by selecting/deselecting the corresponding check box in the Edit Permission dialog box. Click OK and then Close to complete the process. ManageEngine Analytics Plus offers a powerful feature of applying dynamic filters when you embed any view into your Web page. These filters get applied on the fly over the data displayed as part of the view, when users access them in the embedded web page. Using this feature, you can embed the same view in different web pages applying different set of filter criteria, to suit the allowed permission, context and profile of the user who is viewing the page. For example, an embedded sales report can have a 'Region' based criteria in each page that it's embedded, creating a scenario such that, when a sales person from say Region East views his/her accessible page, will only see the Sales from that region in the report embedded. A similar setup can be applied for sales person from other regions. Filters can be applied by passing the required filter criteria to the parameter named ZOHO_CRITERIA and appending it as part of the Embed URL present in the HTML <iframe> code snippet. The embedded view's data is filtered and displayed based on the criteria specified, whenever the web page is loaded in the browser. The filter criteria that is passed follows the same format as that of the SQL SELECT Query's WHERE clause. You can also use SQL in-built functions as part of the criteria. These built-in functions should be the functions supported by any of Oracle, MS SQL Server, MySQL, DB2, Sybase, ANSI SQL, Informix and PostgreSQL databases. The generalized format of simple criteria is given below. ZOHO_CRITERIA="(<column name/SQL expression/SQL function calls> <relational operator> <value/column name/SQL expression/SQL function calls>)"
here 'Finance' is a literal value to match. You can combine any number of criteria defined in the above specified format using Logical Operators like AND and OR to form complex criteria, the same way as in SQL SELECT WHERE clause. Also use Braces '()' to group the criteria for ordering. Enclose string literals (i.e. values) in single quotes. Enclose column names in double quotes. Refer to the SQL SELECT WHERE clause documentation to know more on how to construct the filter criteria.